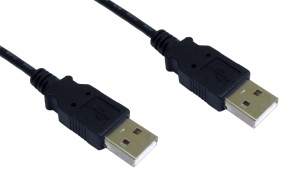 2m A to A USB cable, can be used with USB 2.0 devices or older USB 1.1 devices. Profigold PROM6302 Ultra Speed FireWire 800 IEEE1394b Interconnect 2m. Up to 800 Mbps data transfer between computer and device Complies with the FireWire 800 IEEE1394b standard for unmatched performance White ultra-flexible PVC cable jacket for ease of handling Slim-line plug design for maximum compatibility with portable equipment Superior grade 99.996% oxygen-free copper to guarantee lowest signal loss. D25 to 36 Centronics Parallel Printer Cable 2m IEEE 1284 parallel Printer Cable D25 Male to 36 Centronic Male Moulded Grey PVC IEE 1284-1994 Compliant Ideal for connecting a PC with a 25 pin parallel port to printer with a centronics 36 way connector. Firewire 4 pin male to 4 pin male data cable commonly referred to as IEEE1394, used for connecting devices such as camcorders to your computer.